The west side, with landscaped terraces and a series of stairs leading to a discreet main entrance. 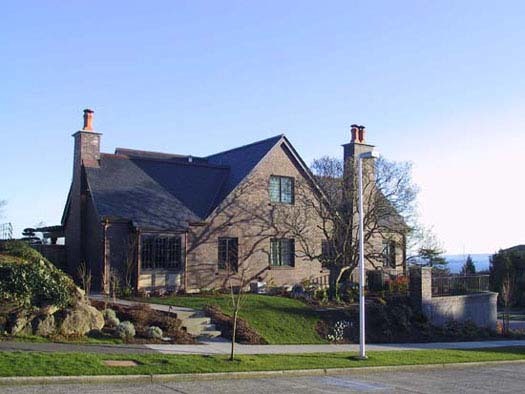 Most of the expansion was located underground (behind the retaining walls) to maintain the scale of the original home. This project is deceptive. 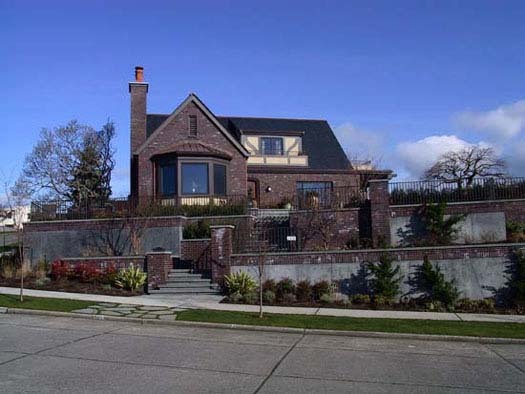 At first glance, it seems a typical Seattle brick Tudor, vintage 1927. Inside, after three years of design and construction, it’s a fully renovated 6,000-sf high-tech home. Above all, it’s the result of intense collaboration between owners and design team to discover and express the owners’ vision of where they want to live the rest of their lives. 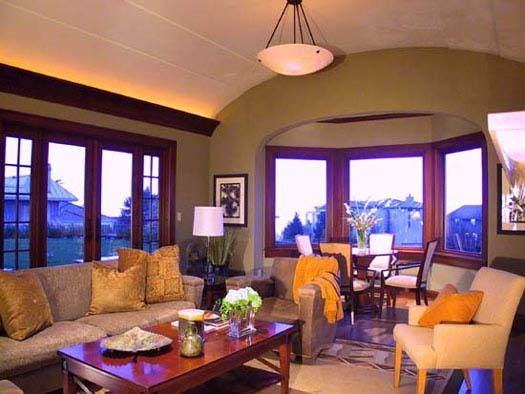 Renovate an existing brick Tudor house without disrupting its scale and the way it fits into the neighborhood. Define a clear organization of space and circulation, creating inviting spaces for guests, yet maintaining areas for private retreat. 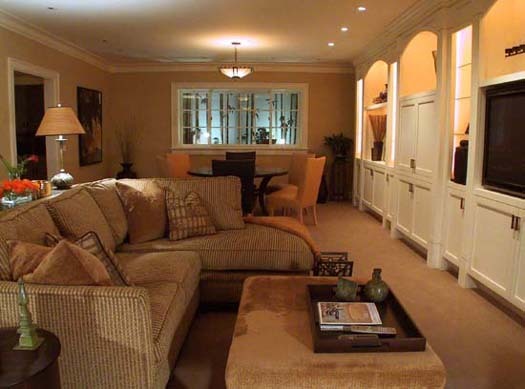 Expand space to accommodate a family room, office, home theater, wine cellar, exercise room, and laundry room. Expand and upgrade the kitchen to a professional level. 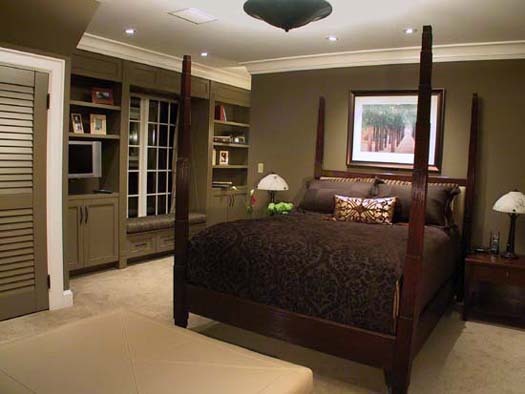 Expand master suite to include large tub with window view, sinks and vanities, and separate shower and toilet areas. Take full advantage of views of the Olympics, Cascades, and Downtown. Incorporate the highest-quality materials and high-tech systems for beauty, comfort, long-term durability, and minimum maintenance. 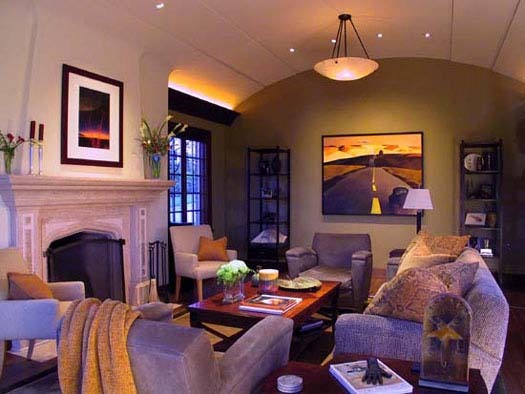 Create a totally integrated environment, including lighting, finishes, furnishings, fixtures, and artwork. The design process has harmonized opposites, with balance between openness and privacy, grandeur and human scale, classical space and Northwest informality, sumptuous materials and simple practicality, high technology and respectful reinterpretation of the art-deco-influenced traditional interior. To respect neighborhood scale above grade, the basement was expanded for additional rooms. Interior walls were repositioned, refining the 1920s layout with clear axes for views and circulation, creating a sequence of events as you move through the space. An art-deco corbel pattern — implemented through painstaking, custom craftsmanship — appears in the front door, repeated ceiling barrel vaults, mahogany casework, railing newel posts, and elsewhere, to develop thematic unity. The space invites discovery: anticipation and fulfillment, symmetry and asymmetry. Each part mirrors and supports the organizing principles of the whole. Like a multifaceted jewel, this home reflects completely the values and taste of the family who lives here. CASA Architecture – Interior Design would like to acknowledge the significant contribution of the owners and other members of the design and construction team: Carl Williams Interiors, Shapiro-Ryan Design (landscape), Lightcrafters, and Prestige Custom Builders. View from the north. The entire structure was resurfaced with new brick. The new roof is slate with copper gutters and downspouts. 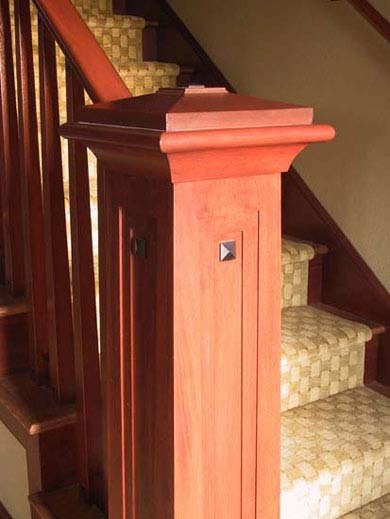 This mahogany railing newel post in the main foyer echoes the corbel pattern of the entrance. View from the living room looking south. Note the corbel steps in the barrel-vault ceiling. Ventilation registers are concealed along with indirect light sources at the base of the vault. The living room from the opposite direction. The new formal mantelpiece of custom stonework houses a high-efficiency fireplace. Central heating is through a high-tech radiant floor system. 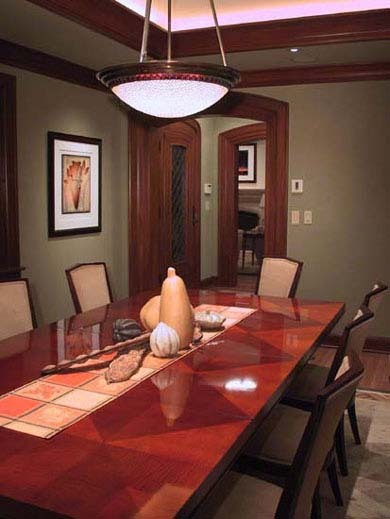 View of dining room, showing custom mahogany casework and indirect ceiling lighting. Note the repetition of the vault motif in the doorways. 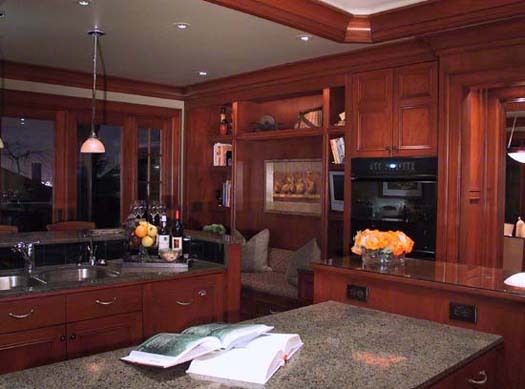 The kitchen features more custom mahogany casework and cabinetry, as well as a granite-topped island (foreground) and peninsula. It harmonizes luxurious finishes with the layout of a professional kitchen, including separate prep and cleanup areas, a built-in rack system, and walk-in pantry. A seating area is built into the cabinetry on the far wall. This library, designed as a private retreat on the main floor, is sound attenuated, with a suspended ceiling and walls built on resilient channels. Powder room on the main floor, adjacent to a guest bedroom (not shown). 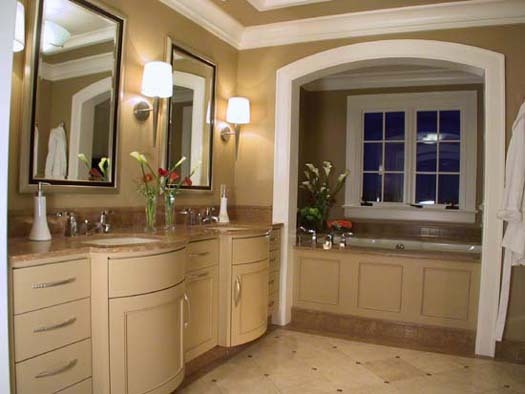 Master bath, with a tub in the window alcove. Tub and window are positioned to reveal a view of Downtown and the Cascades at head height when bathing. Master bath from the other direction, with etched glass doors leading to a shower and commode. 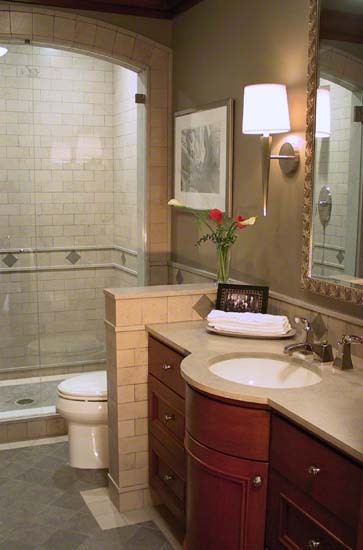 Stone floor tiles include cast-bronze feature drops in the corners. 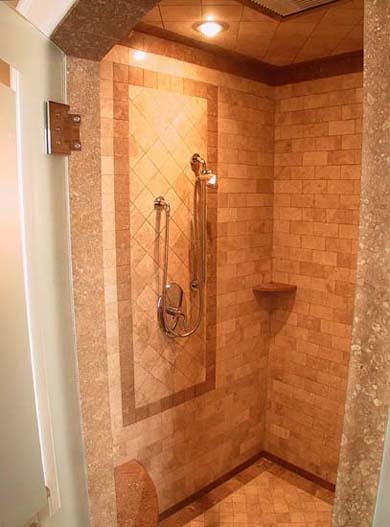 Master shower stall with custom stonework. 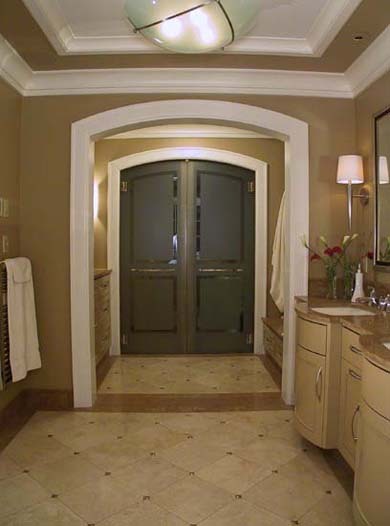 The position of every tile, grout line, and fixture was specifically designed. Family room in the expanded lower level. Above the nine-foot ceiling is a three-foot utility plenum. 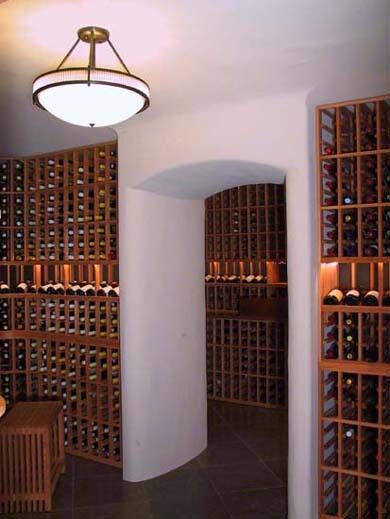 A temperature and humidity controlled wine cellar includes two chambers with barrel-vaulted ceilings, hand-plastered walls, honed limestone floors, and custom storage fixtures. 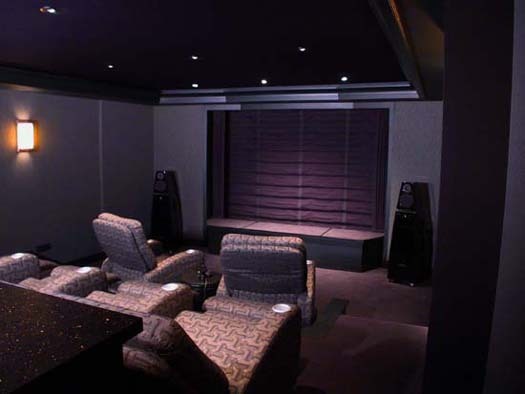 A high-tech home theater, also in the lower level, includes a projection room behind the stage and screen. 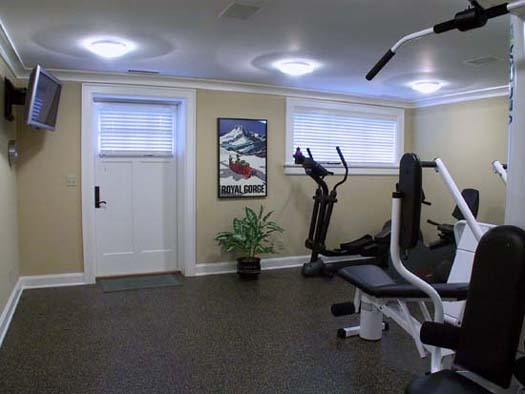 Exercise room leading to a separate outside entrance next to a two-car garage. View from the south, where the lower level is at grade. 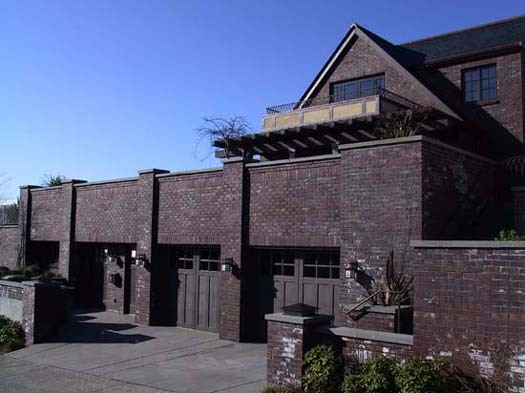 The entrance to the left of the garage doors leads to the exercise room and family room.